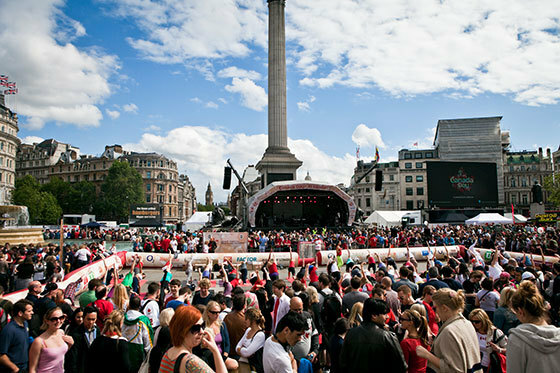 Canada Day in London, details below. Last week's four clue-words (one revealed each day) were Donald, Terry, Richard and Norman. Several people spotted that these are all prominent architects, but only Andrea Casalotti worked out the full connection. Buildings by the four architects are grouped together on Wood Street in the City of London. Donald McMorran designed the police station; Terry Farrell was the architect of the hulking Alban Gate building, which straddles London Wall; the distinctive coloured ventilation and lift shafts mark 88 Wood Street as an archetype from the studio of Richard Rogers; and Norman Foster contributed 100 Wood Street. So congratulations to Andrea, who will set this week's puzzle, starting tomorrow. A third day of sunshine? Surely some mistake? But watch out for that menacing gang of clouds, currently staking out the skies above London. This lawless band of nebulous varmints is plotting to run roughshod over the capital from tomorrow, kidnapping the sun and imposing a climate of grey oppression over the town. In summary: where's Clint Eastwood when you need him?